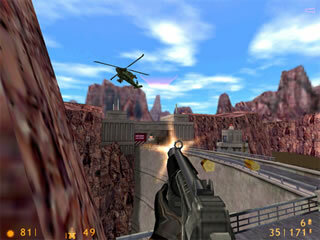 The overall lack on control of some scenes, as well as the dialogue, gave this first person shooter an almost cinematic appearance. Half-Life was the first game I ever played. At the young age of six and since then I’ve been playing every half-life game ever made. I am currently 14. Do the math and if you can’t do the math you really shouldn’t be on a computer. Now Half-Life came out in 1998 and was Valve’s first game. Not only was this game successful but it was considered one of the best FPS games at the time for its AI that was good at the time. The graphics were great… at the time. The game’s overall plot was not to creative and original but how it was presented and the creatures were the creative part. You are a scientist who can use any weapon known to man because, you know, that’s one of MIT’s courses. A scientific experiment goes wrong and aliens are invading and you have to escape. You are Gordon Freeman. What does Gordon sound like? You’ll never know. He does not speak just like in every Half-Life game. How good are the cinematics? You’ll never know. There are none in Half-Life. This was a risky move, well, I see it as a risky move because a cinematic has always been a major part of storytelling so the player doesn’t miss it but Valve trusted its gamers. Then we have our main player never speak. It’s odd after you play other games but it works. I believe one of the reasons why Half-Life was so successful was that it was more immersive than any other game. You are always seeing through Gordon’s eyes the entire time and always have control over him. Atop of that he never speaks. This gives the player freedom for a personal narrative from Gordon. What Gordon’s personality will vary from gamer to gamer. Plain and simple, we truly were Gordon. Another thing I wish to touch are the aliens of Half-Life. 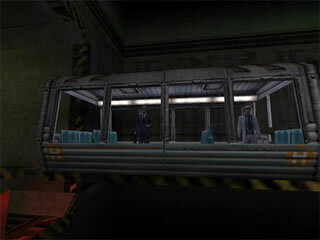 Most alien games make there aliens so very human like but Half-Life was different. Perhaps I am wrong because I have not played every alien shooter before Half-Life but among the popular Half-Life succeeded in making true aliens. Yes I suppose there not all non-humanoids but things like the bull squid and hound eye were nice to see. However annoying they were they were different. Though the headcrab-zombies were actual humans but controlled by aliens. Then there were the controllers which is the closest thing to a stereotype alien. Except its red in a sense and floats and shoots stuff at you which rather unpleasant. They do however have the oversized heads but its okay. They are worthy opponents of Gordon and his crowbar… and a bunch of other random weapons that an MIT graduate knows how to use… somehow. Then there are other aliens that are well above worthy such as the monster called Gargantua. Any fan of Half-Life will have chills run down there spine when they remember the Gargantua. There were more but still. I wish I could do a survey of all the Half-Life players and see how many tries to took to kill the Gargantua there first time. Of course, the main thing was the guns. Bringing down a helicopter with a machine gun was particularly satisfying. Then comes the infamous G-Man. The G-Man is still a mystery. There is not much to say about the G-Man besides that he always seemed to be following in a creepy way and always behind a locked door that would save you so much time but refuses to open the door. He wears a blue suite and carrys around a briefcase. When you play you will see. All in all, I don’t have much to say bad about Half-Life. I really don’t. I’m a fan boy in every sense of the word and would cut off my own foot if it meant getting Half-Life 2 Episode 3 before everyone else. If I must I will point out a few things. There is the fact that there are maybe three different models for hundreds of scientist and one model for the security guards which makes everyone look the same and that gets eerie pretty quickly. Then there are some puzzles that will have you thinking for a little while, especially if you are a pure run-and-gun type. Also this game will have bugs just like every game in the world. The last thing is the very, VERY long train ride that serves as an intro to the game. This train ride shows you the facility but is far too long. These little things will be easily overlooked once you play. Half-Life is my favorite game of all time and the only thing better is Half-Life 2.